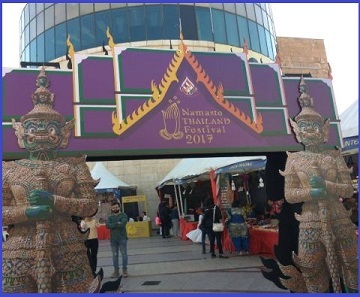 The 3rd edition of Namaste Thailand Festival which is organized by the Royal Thai Embassy with an aim to strengthen bilateral ties and increase cultural exchange between India and Thailand began at Select Citywalk in New Delhi. The Namaste Thailand Festival was started on 15th March 2019 and will conclude on 17th March 2019. The Namaste Thailand Festival will feature stage performances by Thai artistes including the much popular Thai folk-jazz band Asia-7. The Namaste Thailand Festival will also feature a series of Thai craft activities including mulberry paper mini umbrella making, fan painting, body paint, and button badge making along with the traditional Thai cuisines.